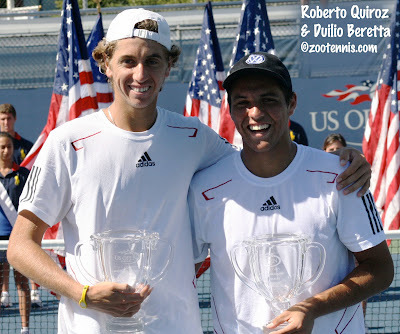 Back in 2004, Jack Sock and Denis Kudla shared a special moment, when as 11-year-olds, they won their first gold balls, taking the doubles championship together at the USTA Clay Courts 12s. On Sunday, they will have another memory of a lifetime, but there will be only one winner when they play for the U.S. Open boys singles championship. 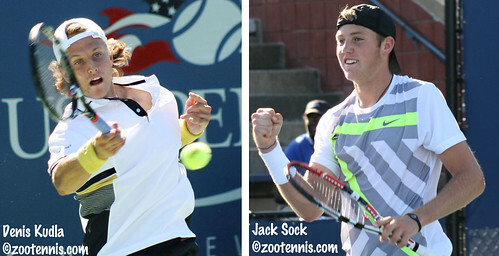 Sock, an unseeded wild card, and Kudla, the No. 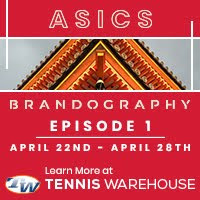 10 seed, produced the first all-American final since Andy Roddick beat Robby Ginepri in 2000, when in Saturday's semifinals they took out the past two junior slam winners. Sock defeated No. 2 seed and Wimbledon boys champion Marton Fucsovics 6-3, 6-4, several hours after Kudla had already ousted No. 8 seed and French Open boys champion Agustin Velotti 6-3, 6-2. Against Velotti, Kudla got his first break with Velotti serving at 3-4. Serving for the set, Kudla faced two break points at 15-40, but at that juncture his improved serve proved invaluable. From that stage through the end of the four-deuce game, Kudla got 9 out of 10 first serves in, saving three of the only four break points he faced in the match with two service winners and an ace. "We've been working on it, and it's been helping me so far," Kudla said. "I haven't been broken too many times. I'm keeping it at a high percentage, knowing that I'm not going to serve bombs left and right. So I'm just trying to stay solid on my serve, and in my last two matches, I don't think I've been broken." In the second set, Kudla dominated the 18-year-old from Argentina, at one stage early in the set winning 11 points in a row. Velotti made a slew of unforced errors, but his uneven play didn't affect Kudla, who hit through the ball with authority. It did take him three match points to seal his place in the final, but the relative ease of his victory was unexpected. "He kind of surprised me with his level today," said Kudla. "I know he didn't play his best tennis. I didn't play my best tennis either, but I played all right and I'm glad that I got off the court quick and will have all my energy left for the final." If Kudla was hoping that Sock would have a lengthy struggle with Fucsovics, he was disappointed. Sock didn't face a break point in his match, and Fucsovics was constantly under pressure on his serve. Unable to hit more than two or three ground strokes before missing, the 18-year-old Hungarian was ineffective despite the ideal conditions, with light breezes and temperatures in the mid 70s. Sock, who has yet to lose a set in the tournament, has played Kudla only once, losing 6-4 in the third in the Kalamazoo 16s quarterfinals in 2008. Kudla said on Friday that he had hoped to play Sock in the 18s final at Kalamazoo last month, but those hopes were dashed by Bob van Overbeek, who saved three match points to beat Kudla in the semifinals. "It was a tough loss for him, and a good comeback for Bob," said Sock. "I haven't played Denis for a long time and I was looking forward to maybe playing him there, but he didn't get through. Tomorrow will be a good match." Kudla is also looking forward to his first junior slam final, which will be his last junior match. "I came into this tournament with no pressure," Kudla said. "Just enjoying it, knowing it was my last tournament, just have some fun. Knowing that I'm in the final, it's pretty special to know I'm one match away from winning a junior grand slam. And knowing if I do do that I'm the first American winner since Roddick. Following in those footsteps is pretty special." 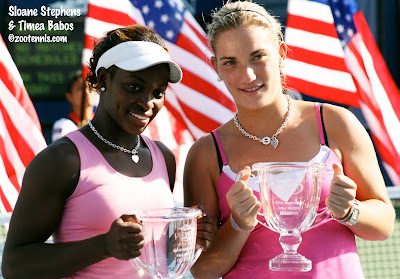 The last Russian girls champion was Anastasia Pavlyuchenkova in 2006, and on Sunday, either top seed Daria Gavrilova or unseeded Yulia Putintseva will join her and Maria Kirilenko as US Open girls champions this century. The 15-year-old Putintseva has played better with each match, and although her serve was a bit off, and she and her opponent, unseeded Ons Jabeur of Tunisia, held serve only once total in the second set, Putintseva's competitive fire was intact in her 6-4, 6-3 victory. Gavrilova, like Putintseva a student at the Moratouraglu Academy in France, eliminated the U.S. hope for a junior championship singles sweep when she outlasted No. 15 seed Sloane Stephens 7-5, 1-6, 7-6(4) in a contentious match that took over two-and-a-half hours to complete. Stephens was the clear favorite of the crowd gathered around Court 7, whether it was due to Gavrilova's ball-striking shrieks, slow play, or simply her nationality. In the third set, Stephens was up a break twice, at 2-0 and 4-3, but she lost both. She was in the difficult position of serving at 4-5 and 5-6 in the third set, but had no problems in that position. She started slowly in the tiebreaker, however, falling behind 4-0. Stephens won the next three points but Gavrilova hit a perfect drop volley winner to make it 5-3. The next point was a huge one, but Stephens couldn't handle the moonball Gavrilova gave her, attempting to flatten it out, only to see it find the net. Stephens saved one match point when Gavrilova hit a backhand wide, but the match was over on the next one, when Stephens' forehand volley went long. Stephens was frustrated by the style of play Gavrilova employed, especially after having defeated the 16-year-old Russian in straight sets this year at Wimbledon. "She didn't hit one ball, she pushed the entire match," the 17-year-ol Stephens said. "At Wimbledon she was trying to hit. Obviously everyone hits on grass because it's grass, but today she was pushing, pushing, pushing and then she'd try to hit one. The way she was playing today was so in and out, so sporadic that it was hard to see what she was going to do." Stephens may have had a disappointing finish to her year in junior slams in singles, but she ended 2010 three for three in junior slam doubles titles. She and Timea Babos of Hungary captured the U.S. Open girls championship when An-Sophie Mestach of Belgium, half of the team with Silvia Njiric of Croatia, was unable to compete due to injury. Babos and Stephens, who played together for the first time in Paris, won at Roland Garros, Wimbledon, and now New York. "It's awesome," Stephens said. "With Timea, we're really good friends. On the court, we're good together and off the court we're good together. Last year I had such bad luck with doubles partners, but this is a pretty good payoff, and I'm happy." Stephens and Babos are not the only multiple junior doubles slam winners this year. No. 3 seed Duilio Beretta of Peru and Roberto Quiroz of Ecuador, who won Roland Garros this year, did not drop a set on their way to the U.S. Open boys doubles title. On Saturday, they defeated No. 4 seeds Oliver Golding and Jiri Veseley of the Czech Republic 6-1, 7-5. The singles finals are scheduled simultaneously for noon on Sunday, at courts 7 (girls) and 11(boys). I will primarily be covering the boys final. A grounds pass is available for $5.00. 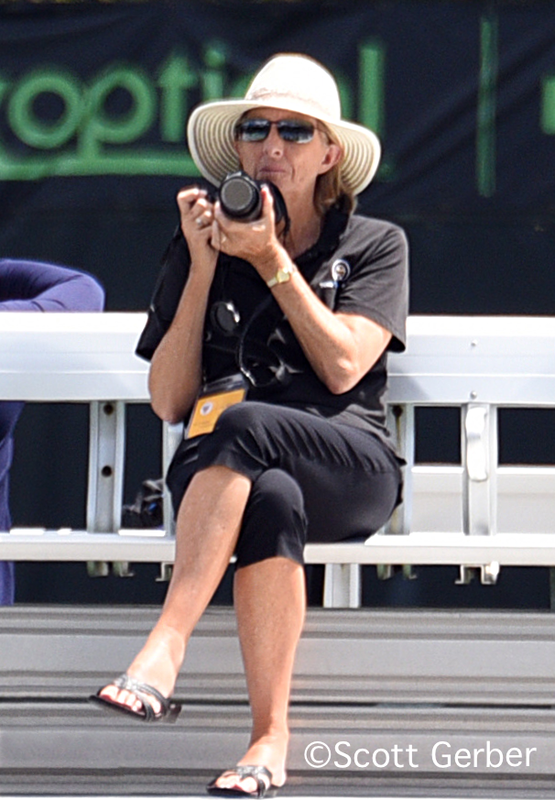 Colette, a minor correction: the Kudla-Velotti score was 6-3, 6-2. WELL DONE!!!! Dennis and Jack. You make us proud. What great players. They should vie for the Open title in years to come. Congratulations to Jack for capping his great summer with the US Open Junior title. And congratulations to Dennis on making it an All-American final. Good stuff!